Saffron Tree: Out of the Way! Out of the way! Yes, indeed! There are two Umas in the children's writing space. One an illustrator and the other an author. If that is not out of the way, what is??! 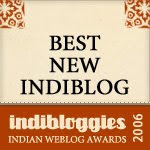 Saffron Tree is pleased to review Out of the way! 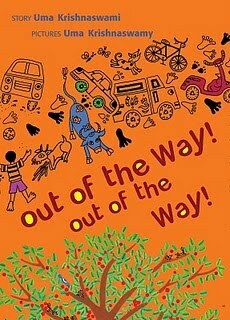 Out of the way!, a lively- lovely picture book from both of them, launched under the Tulika umberella. When I received the book from Tulika, I was completely charmed by the illustrations - so vivid and energetic, full of detail and folk art-like. The vehicles and the activities around clearly communicate the stage of urbanisation even to young minds. The refrain ( the book's title) is woven into the illustrations, almost on every other page, engaging early readers, who will enjoy spotting and replaying it. The first time I read the book, it triggered memories of Leisure-a poem learnt a long time ago and written even earlier by W.H. Davies..."We have no time to stand and stare..."
However when I re-read it, I realised that the author is very optimistic in her view that man and tree, urbanisation and nature coexist, making room for each other. It is difficult at times to pin point who is IN the way!! That there is a mid way, despite the apathy that seems to colour most people's world view, is so reassuring in today's context. The book reminds and goads us in a subtle manner to pause and take in life in all its beauty and nuances. The main characters are a sapling, a path and a young boy. The sapling maintains its glory and evolves into a tree- a care giver. It is also a spectator- in the sense it watches the village turn into a town and then a bustling city. The path grows into a lane and into a street and finally a main road. While most people are too "busy", the boy enjoys the tree. He grows into a man, a father and then a grandpa who reminisces about the past and the stories gone by. And where else does he do all these but under that very tree. The book ends on a cheerful high- focusing on the positive- the few people who make time to stop and listen. And the word listen stands solo- above a flourishing bird filled tree- dramatising it further. The richness of illustration together with the simplicity of language help express a deep philosophy of life that is all too easy to forget in today's mad (and maddening) rush, where even summer vacations are often about activity camps and "purpose", devoid of the spontaneous joy of chilling out. As I was reading to her, I wondered if Anushka, my four year old daughter, was only excited by the visuals and the chant "Out of the way! Out of the way!" which she eagerly took up. After a while, I asked her what she thought about the story. She said that the tree and the boy were friends and they grow up together and take care of each other. The message had definitely hit home and in a very non-patronising or didactic way. Kudos to all those involved in the making of this engaging book! ST: How did the idea occur to you? In his latter years my father, to whom the book is dedicated, and who passed away this January, used to tell me stories whenever we spoke on the phone. Or he'd tell me about some odd anecdote or other he'd read about in the newspaper. I started writing them down. This one came from a news report about a group of people who dealt with potholes in their local road by planting trees in them. It was such an eccentric and subversive action that I was fascinated. From there it grew into a story about a child finding a tree growing in a road, and over successive revisions it became the story it is now. ST: Any anecdotes around writing the story? For a long time I tried to make the boy a central character whose actions drove the story, and it didn't work. After the initial act of placing rocks around the tree, everything I made him do felt too authorial and contrived. 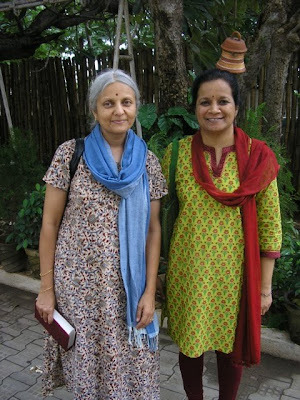 It was Sandhya Rao, my editor at Tulika, who suggested placing the boy at the edge of the story rather than its centre. Take the focus off character? How does that work? As I revised the text I began to realize what I needed to pursue as a central idea--not an either/or but the road and the tree, with the child as witness rather than actor. It was a huge narrative shift, and I'm grateful to Sandhya for accessing the intent behind my story before I could see it. I was getting a little troubled by the didacticism creeping into earlier versions of the story, so her suggestion made complete thematic sense. As the words began to reflect the content, I started to see the curves of the road echoing the curving sounds of the refrain. ST: How did you decide this was the book to link up with the illustrator Uma on? I didn't at first. A few illustrator options were explored and nothing seemed to fit. Uma and I had been corresponding for a while, and had become friends, and I loved her work. She'd also illustrated a poem I wrote for Cicada magazine a couple of years before. It seemed a natural connection, especially as they were looking for a folk-meets-contemporary kind of style and she'd done other books with them before. Of course I was thrilled with the result. And it sort of fits the way that words in the text repeat themselves, to have the author and illustrator names doing that as well. The book has been published in English and 8 Indian languages. You can order your copy online from Tulika. I really liked the last line of the interview...sometimes coincidences are so significant. The book looks and sounds very attractive! Tulika certainly is a trailblazer, off-the-beaten-path in this case is most certainly not out of the way! Saw the book recently. Nice review Art. Seems like a wonderful book. 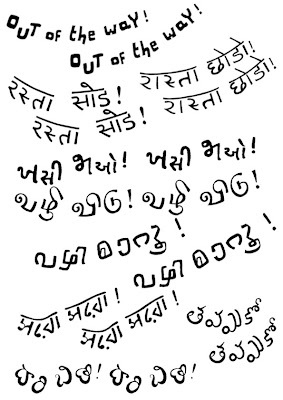 I have seen this in Landmark, but they have only the Kannada version as yet and (ahem! )as my Kannada is very scratchy, I couldn't enjoy the story. Although I loved the illustrations. The idea behind the book somehow reminded me of 'The Giving Tree' by Shel Silverstein, although the only common factor is the association of the boy growing up and growing old with the tree. The book also somehow is very identifiable with the current Bangalore with its various road building projects and the sad fact of so many trees being destroyed. And the chaos on the roads! - I think Sandhya Rao would have been a kid/ teenager herself then!! 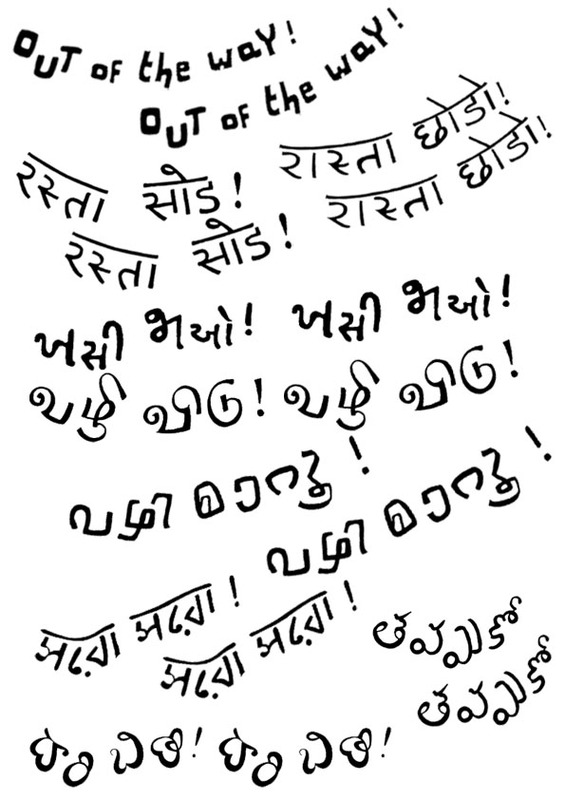 sandhya- how many of those can you read on the multi lingual collage picture.I can do only a measely 3. Navy can do 6!! Sure chox can too. This book really looks interesting.. nice review... I first saw the book on the tulika website. but havent been able to lay hands on it yet... shall definitely do so soon! and loved the interview! Thanks for a wonderful review Art and it was very interesting to hear the idea behind the story from Uma ! What a great start to the Blog Tour! I love your Q&A - I didn't know that people are planting trees in potholes! Thanks Art for bringing us a very lovely review, and neatly following it up with an interesting interview. Thanks again, Art & Uma. Praba says: "out of the way" could actually mean different things in different contexts. Sure it could. And if it sparks a little ambiguity in readers, that's okay too. Children will draw their own conclusions in their own way. One of the things I've learned in my years of writing is that we not only can but we must trust young readers. Art, that was a lovely review. Thoroughly enjoyed reading both the review and the interview. Thank you for this review and interview. I especially love the two images posted! Art, your review is compelling. Love the author's positive out look that nature and urbanisation can co-exist. Also interesting behind the scenes(Uma's how the book was born and trivia abt the page format on her blog) of making of the book. Indeed, Uma. Also, children are naturally open to new information and new points of view. So many issues and events in our world have two, or maybe three or more sides. Therefore, a certain ambiguity can be a good thing and can only mean an opportunity for discussing different ideas and points of view. And perhaps, offering children this in the abstract during the early years -- for things that don't affect them immediately or directly - can be good practice for the tougher issues they will be facing as adults. The idea of the tree standing nice and tall amidst all the urbanisation makes me hopeful about the future. And that progress should / can happen in a less harmful way is a very optimistic message for kids / adults today. Thanks for this refreshing perspective Uma. And Art, Leisure brought with it Nostalgia, took a minute to stare at and enjoy the poem after a long time, thanks:) Review and interview neatly done, kudos! How did the 'krishnaswamy' with Y and 'Krishnaswami' with I confusion get solved for the tamil version of the book? utbt- that is a good question- will await Uma's take on that- I suppose in any of our regional languages they would not look different!! utbtkids, they don't look different in any of the Indian language editions. However, if you read the blurb on the back you can tell there are two Umas. Oh, the confusion! I love it. Uma and I used to talk about how much fun it would be to do a book together. It still seems pretty unbelievable that we finally have. It was a treat to read the review followed by the interview with the author. Thanks Art! !